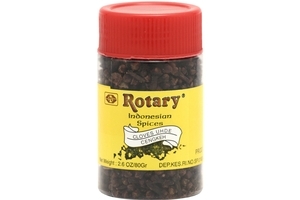 Rotary Indonesian Spices Whole Cloves (Biji Cengkeh) in 2.6oz (80g) Plastic Bottle.Cloves have a distinct flavor and are used in many types of Asian delicacies especially Indonesian. Product of Indonesia. Halal Certified حلال .